WRITING infectious pop melodies from a young age, Emma McGann grew up with the likes of Alanis Morissette & Imogen Heap on repeat. Small-town girl Emma has since molded those melodies into colossal pop anthems, gaining BBC Radio 1 airplay, nominations for various awards in the US including a Shorty Award and an iHeart Radio Music Award in 2017 and has amassed over 10 million views on her livestreams. 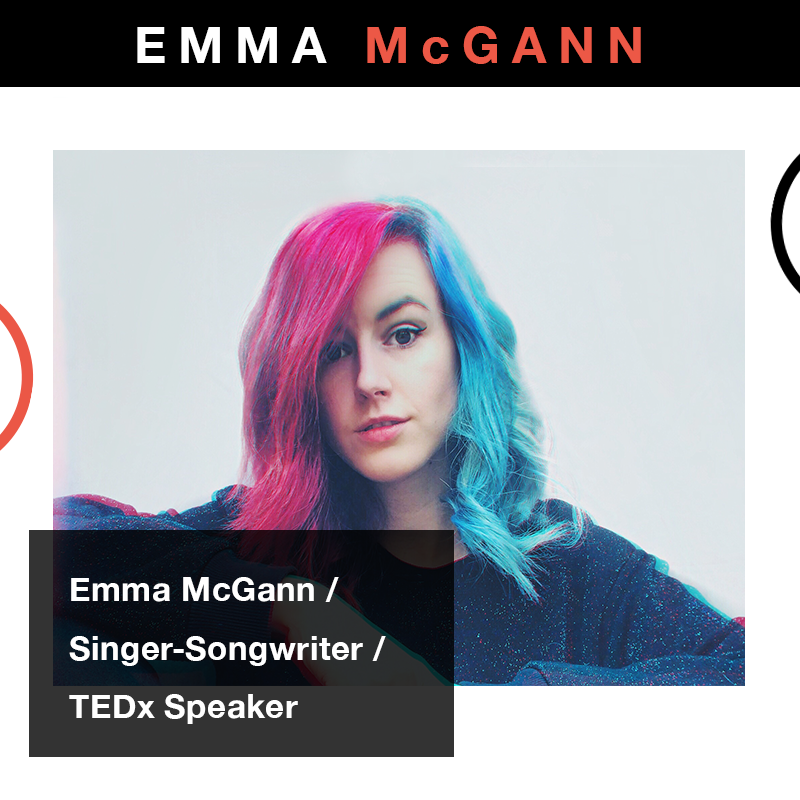 Passionate about interacting with her audience, Emma’s TEDx Talk explains the importance of her YouNow livestreams and connecting with her supporters. She has received recognition from some notably fierce female forces in the industry including Kylie Minogue, Nancy Sinatra and Beth Hart. Emma prides herself on being independent - after successfully raising £21,000 via Kickstarter with the help of her supporters, her recent album ‘B.R.A.V.E’ gained 20,000 streams in its first month as an independent release. I remember jolting out of bed at 14 years old with a melody ringing in my ears. There were these framed, faded photos I had on a windowsill that sparked this idea of a short-lived summer romance. The idea was to show how feelings like this can fade, similar to how the sun can dry out photos and make them look all washed out. I started digging through this old box to find a microphone I’d had lying around for forever. It was this £8 piece of junk meant for your PC webcam. It was terrible. But regardless, I’d never heard my own voice recorded before and this song idea was buzzing in my mind so I wanted to make it work. I somehow managed to record it with some really old, useless audio software that came on a disc with the microphone. I sat there all day recording take after take (it was literally a 1 minute song) and I was beyond nervous to show anyone. I called it ‘The Summer Song’, uploaded it to MySpace and anxiously went to school the next day. I was so relieved to hear my friends say they liked it. I was even more relieved to get a microphone upgrade that Christmas. It was definitely the beginning of me finding myself as a songwriter. It kickstarted everything really. I like to move around and be in different environments when writing. Traveling definitely brings out more inspired ideas for me. For the latest album, a lot of the tracks were written in while in Amsterdam and during a road-trip on the US West Coast. I wrote ‘Loveseeker’ on the way to Nevada from LA. We stopped off at a place in San Bernardino and I wrote the song while we were there. We flew up a drone we had with us and got this aerial view of these sand dunes and this winding palm tree path that led to a spring - it sort of looked like a maze. And that’s the ‘maze’ that you can hear in the lyrics of that song. Once I have a defined idea for a track that’s when I wanna take it to the studio and start developing it. When I know I have that solid idea I’ll happily lock myself away in the studio and work until it’s done. The Donna’s, Alanis Morissette and Liz Phair were all I ever used to listen to growing up. I was definitely inspired by strong female voices. Alison Robertson, the guitarist from the Donna’s was all I ever wanted to be at 15. I adopted her whole style and spent so much time trying to nail the riffs from the ‘Spend the Night’ and ‘Skintight’ albums. The Donna’s really drove me to start my own all-female band while I was still at school and it was their influence that had the biggest effect on my songwriting growing up. Liz Phair’s self titled album was another key record for me as a teen and led me to discover her earlier stuff. There’s a picture somewhere of me posing with her guitar in the Hard Rock Cafe in Vegas in 2005 with the cheesiest smile on my face. When we got back to the UK I performed a cover of her track ‘Why Can’t I’ at a school concert and literally no-one knew the song. But I performed with the same cheesy smile on my face and loved every damn second. I’m still a big fan. My music taste evolved over the years and I found that my songwriting style began leaning more towards the commercial pop realm. Katy Perry’s ‘One of the Boys’ was a defining album for me. It was the perfect balance of light, dreamy pop and gritty, guitar-driven girl power and this style influenced my first single ‘Cherry On Top’. Sharing the stage with Beth Hart two years ago was an unreal moment for me. Beth invited me on stage at a sold out show in Brighton, UK in 2016 to perform two tracks with her: ‘Delicious Surprise’ and ‘Learning to Live’. Jeff Beck was in the audience too… so, no pressure. We hung out before the show, had a chat and did a livestream together. It was a surreal and special moment to share the stage with one of the women who I discovered in those early years of recording my own music in my bedroom at 14. Beth and her whole team were just so great and welcoming. I loved every moment. I think we’re seeing more and more artists wearing all the hats - songwriting is just one part of the job these days. Chances are, if you’re the artist, you might also be the manager, the agent, the producer, the videographer, the social media strategist... And it’s a necessity, for independents especially, to hold a combination of these skill sets. 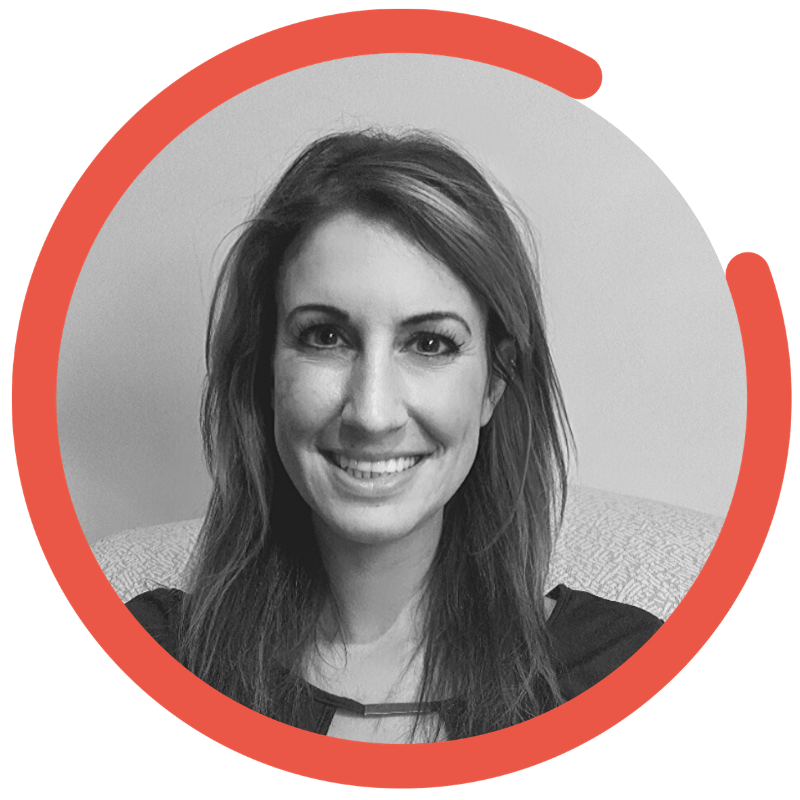 We’re constantly having to navigate through new territories online to make ourselves more discoverable because that’s where eyes and ears are these days - on devices. Artists are becoming their own bosses. They’re taking charge, they hold the power and it’s inspiring to see. What inspired you to write your book “The Songwriter’s Handbook For Beginner’s”? Back in 2015 I started a series on YouTube to inspire beginner songwriters to get started and stay motivated. My inbox was full of questions from fans about how to write a song or how to at least get started. So creating videos where I answered these questions felt like a worthwhile idea. No one else on YouTube was providing this style of content back then so I’d found a niche and my channel started to grow even more. ‘The Songwriter’s Handbook for Beginner’s’ is an extension of this YouTube series. The first volume is focused on self-motivation and the second volume will outline best practises for setting up a home studio. I aim to release even more volumes in the future. 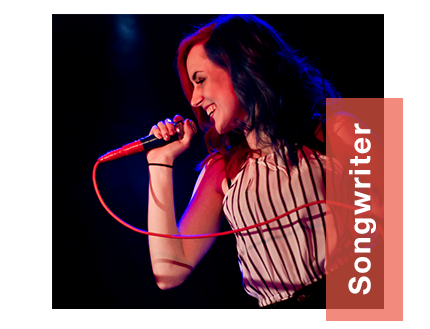 How important is it for songwriters/artists to involve their supporters/fans in their work? For me it’s hugely important. My fans are my dream team. In some ways they act as my label. They’re always passionate about the music and even helped fund my album last year - we raised £21,000 on Kickstarter. So I always aim to reciprocate and be as inclusive with the people that make it all possible. I think it’s important for artists to recognise that fans aren’t just eyes and ears that’ll hopefully buy your merch - they’re a part of your whole journey if you’re willing to share the moment with them. They’re your community. That’s why livestreaming is so important to me. It allows me to have that direct connection with the people who believe in what I’m doing. It’s validating. And to be honest, it’s so much fun to get to know them. I have some house shows lined up for the rest of the year which are always fun and I’ll be starting a new YouTube series in August. Mostly though, I’ll be songwriting for the rest of the year in preparation for a huge project I’m planning that’ll take place in the next couple of years. I’m announcing more details in the next month or so, as well. I’ve never been more excited for anything! It’s something that’s really gonna take things to the next level for me. I hope we see an industry begin to grow that’s fairer to the songwriters and initial creators of the music. I think we’ll see new tech and new platforms emerge for artists that encourage them to be more self-sustaining. Nowadays a lot of independents rely on social media alone to boost their profiles and I feel we’ll see more and more independents flourish without the help of majors. For future generations, I hope that ten years from now the career path of a ‘musician’ will be just as encouraged as that of any other career - instead of being seen by some as just a pipe dream. Thinking outside the box is essential. You’ll find yourself in a sea of noise at first. Everyone around you will be doing the same thing so you need to do something no-one else is doing. Innovate, network and always write the music you truly want to write. I’m loving Hayley Kiyoko’s new album. The track ‘What I Need’ is such a bop.